After the controversy surrounding the PureView camera on the Lumia 920, Nokia is back with another blunder. Nokia recently revealed the Lumia 920's pricing in Europe, based on which Nokia may have another dud on its hands. The pricing decision may also have played a part in the uncertainty surrounding carrier partnerships for the Lumia 920 launch, which sent the stock price crashing recently. Most media outlets have been up in arms because the Lumia 920 has been priced above the Samsung Galaxy S3 and almost at par with the iPhone 5. While this would be a factor against high-end models, the limited ecosystem would be a larger competitive disadvantage. My prime concern is how Nokia's WP8 based Lumia devices have been priced against their counterparts from HTC. HTC's high-end model, the HTC 8X, has been priced far lower than the Lumia 920 and almost at par with the mid-range Lumia 820. This decision could also explain why Nokia refrained from announcing the Lumia 920's availability & carrier partnerships during the unveiling. HTC, on the other hand, announced partnerships with 150 carriers in 50 countries for the 8X and 8S. Given the pricing, most carriers would have picked HTC's devices over Nokia's. Even though Nokia may have offered its devices to carriers at a lower price than those quoted above, it is unlikely to be below what HTC had offered. In order for Nokia's devices to be competitive, the subsidized prices would have to be on par with other WP8 devices on the market, thereby giving the carriers a greater subsidy burden. Carriers have been rooting for a third platform to give them a bargaining chip to reduce subsidies on other devices, so this would defeat the whole purpose and put a strain on Nokia's already weakened carrier relationships. While shipments had doubled for various reasons, the average selling price of Lumia models fell from €220 to €186 and should fall even further in Q3. 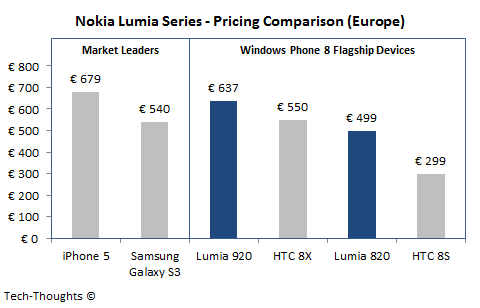 Even an average of €200 is far below the prices specified above and the launch prices of other major Lumia models. The only explanations are that the Lumia sales mix is skewed towards lower end devices or that Nokia has had to continually cut prices to get rid of unsold inventory. Given Nokia's limited presence in the low-end market with Lumia devices, I'd say the latter is more likely. Even though the Lumia 800 & Lumia 900 had received extremely positive reviews when they launched, they did nothing to lift Lumia's ASP. My guess is that Nokia is hoping the Lumia 920 & 820 can do what the previous models didn't and help boost ASP. Nokia is attempting to boost its sales mix and benchmark itself against the Galaxy S3 and the iPhone. Unfortunately, its brand is nowhere near as strong anymore, especially in the high-end smartphone market. 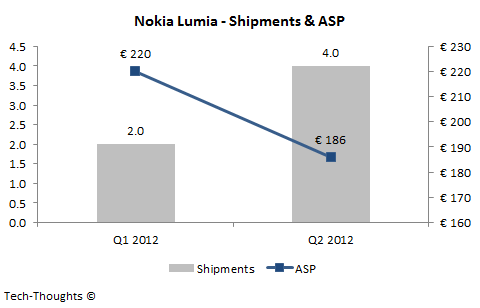 The Lumia 920 will probably give Nokia a temporary ASP boost on launch, followed by another decline driven by inventory concerns. The comparison between Nokia Lumia 920 and Iphone 5 has to be done with the 32GB version of the IPhone5 and not with the 16GB one. What a total disaster even before the new Lumia's are available. Come on, nobody can claim any longer they didn't see that coming that the secind round will fail like the first did already. 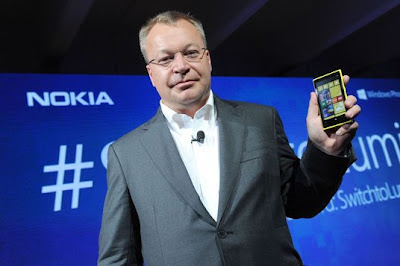 Please weak up, fire that Elop and get Nokia back on track. Please. The comparison of prices between Nokia Lumia 920 and IPhone5 has to be made with the 32GB versione of the IPhone and not with the 16GB one. For example in Germany the prices of the IPhone5 are 16GB => 679€, 32GB => 789€ and 64GB => 899€ and in Italy are 16GB => 729€, 32GB => 839€ and 64GB => 949€ and the prices of Nokia Lumia 920 will be in Germany 649 € and in Italy € 599. In this case, not necessarily. The base pricing makes the first impact on a potential consumer. Since most sales are focused on the base version, most consumers are likely to compare the cheapest versions of each device available. More importantly, since there's no 16GB version, the price of the 32 GB Lumia becomes the base for subsidies from each carrier. And that is because people who will want just 16GB will not consider Lumia ????? Or what? Carrier relations is what matter. I think to be a successful smartphone platform, you'd need both carrier and developer support. Carrier support is a must to get the devices into the hands of customers. Developer support is a must to get the platform into the hands of the tech-savvy, spread word of mouth, help retain customers and push growth into the next orbit. Unfortunately, Nokia's chosen strategy has failed at both. Developers will come if you can show sale numbers. Or on the promise of such (aka WinP7 story). I partly agree. It's a bit of a catch 22 situation. This late in the game, you need both. You need an ecosystem to drive sales and sales to develop an ecosystem. You normally rely on heavy word of mouth marketing from numerous early adopters. At this point, most of those consumers need to see an ecosystem before jumping in.